Sneaking into the majestic house on Park Row last night and unlocking the door for the well-dressed stranger had been exciting. Still, Roger knows that what he did for Circus was wrong, especially when he learns from the newspaper that one of the inhabitants was killed. But the fifty dollars he earned is a fortune! His mother never seems to have any change left over for dinner after she buys her daily supply of liquor. And his father is in the hospital, recovering from a gunshot wound. With fifty dollars Roger can buy those yellow trousers he’s been admiring and a decent dress for Lulu, his younger sister. Now Circus is asking him to pull another job. In spite of the temptation of easy money, Roger vows he won’t listen to that fast-talking redhead. Too many unanswered questions buzz through Roger’s mind. Who shot his father? Why does Circus take such an interest in his father’s health? Why does his father ask questions about a redheaded man? And what is Circus’ connection to his father? 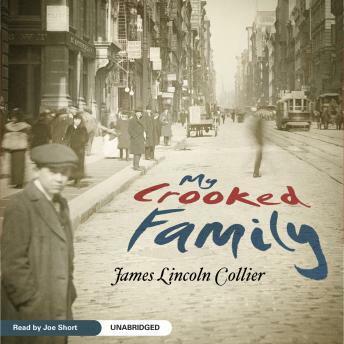 My Crooked Family is both a gripping mystery and a powerful coming-of-age novel about a fourteen-year-old’s decision to enter a world of professional crime.